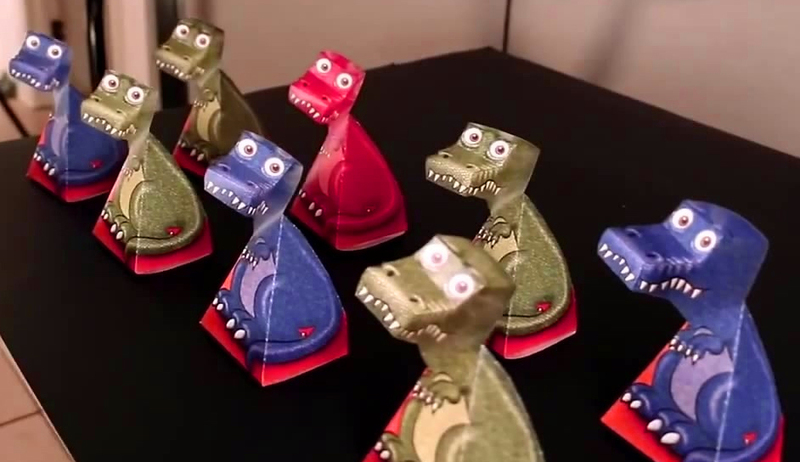 Home Ink Cartridge News Do you want to create your own scary T-Rex illusion! Do you want to create your own scary T-Rex illusion! Do you want to be imaginative and have fun with illusions? How about you print off your own T-Rex today by going through the instructions and be creative. All you have to do is watch the video below to make a scary dinosaur which will always be around wherever you go! Ready to blow your minds with an illusion check the video out by watching it below. You can use any printer to print out the cut-out. If you have ran out of cartridges you can order them from Ink N Toner UK where you get the best quality ink and at the same time you save money…what a bargain hey! To make your T-Rex illusion all you have to do is print off the images in this page and create the T-Rex chosen from your liking. From a click of a button you can start creating your T-Rex illusion by cutting it out and building it up with your stationary which is required (from above). As soon as you finish you can leave it anywhere you want to fool your friends and family. When you move, it will create an illusion that the T-Rex’s head is moving and is following you. This is awesome to play with. It is very fun you can go back or fourth side to side and it will follow you around. It is like looking at an object and the head is turning, looking straight back at you. This T-Rex illusion is suitable for any age as it brings fun to your family and friends. When making it you can also try out different designs, however if you are willing to try out your own designs (which will be a lot fun) please be careful and follow the steps properly otherwise the illusion may not work. The fun part is you can create your own creature for example a giraffe, lion, tiger or elephant. To make your scary creatures stand out, we recommend you use cartridges from Ink N Toner UK as they provide you with best quality inks. If you want to make it as a kid toy for your kids to play, don’t scare them with a T-Rex you might want to go for something more friendly and suitable for a child. You can use the illusion for anything such as placing it on a window so when people look past the T-Rex, it make scare them as the T-Rex head is moving with you. The T-Rex illusion can also be used for pranks on YouTube e.g. Get a life size T-Rex or a different design and frighten the life out of the people. This will be an amazing prank to play on your friends and entertain your viewers. Halloween is coming up, so this T-REX illusion can be the perfect gift to put on your window or outside your house even at parties to give a good scare. You can use any design you want such as a zombie, Frankenstein, mummy and other scary monsters to give you the creeps. All illusion goes great with Halloween. If you are not keen on the normal green colour T-Rex maybe go for the red colour or purple colour as it looks more exciting , but if you are scared and you are a lover of pets create your own illusions with cut-outs of cats, dogs, rabbits or even your favourite animal. This entry was posted in Ink and Toner News by aalim. Bookmark the permalink. aalim is the "Creative Guru" at Ink N Toner UK, and writes the intriguing blog articles you all love to read. When he is not writing about things related to printers, he is exploring his mind to find other wonderful things that you will be happy to read about. Busting the Myth that Printing is not Sustainable! Your very own Printer buying guide! Its Movember at Ink N Toner UK! Halloween is round the corner! Its National Spreadsheet day today! How to clean a print head! New compatible PGI-580XXL and CLI-581XXL available for the Canon TS and TR range! The summer holidays are almost over! Reading Festival is on the horizon! What great weather we have in the UK! The Müller Anniversary Games are here! Printer Updates and how to deal with them! Its Scorching hot with us at Ink N Toner UK! Download the latest 2018 Russian World Cup Wallchart! The 2018 World Cup is approaching….. The EU and its new plastic waste legislation. Bank Holiday Weekend at Ink N Toner UK! Its Star Wars Day. May the 4th be with you! Avengers: Infinity War is finally upon us! Summer has come early at Ink N Toner UK! Sport Relief at Ink N Toner UK! Stephen Hawking, a brilliant cosmologist. Mother’s Day at Ink N Toner UK! Chinese Lantern Festival, Get Creative! Lexmark and their new universal printer driver update! Valentine’s Day at Ink N Toner UK! The Winter Olympics, show your support! The EU GDPR and what you should know. Starting up a 3D Printing Business. 4 Great ways to make money with printing. China’s new environmental audit. Is it as good as it sounds? Christmas is fast approaching, ideas from us! The HP AMP 125 Printer, Our review. Affordable Printers and accessories you can buy with us this Christmas! Print your own christmas cards with us! Extending the life of your printer. Remember Remember…. Bonfire night, safety and having fun! ETIRA responds to HP’s misleading info about remanufactured cartridges! TEN OUTRAGEOUS THINGS TRUMP HAS SAID SO FAR!! What is the circular economy and why does it matter? HEWLETT PACKARD ARE AT IT AGAIN WITH NEW CARTRIDGE ERROR MESSAGE! What is a counterfeit cartridge and can the issue be stopped? Today (July 7) is World Chocolate Day! Majority of University graduates will never pay off student loan! What Do The Letters Mean At The End Of Your Printer Model Numbers? The Best Fidget Spinner In The World! Make your own GCSE Flash Cards here! May the 4th be with you! Star Wars Day! Thank your mum for all she does with our Personalised Mother’s Day Cards! Happy Pancake Day – Celebrate Shrove Tuesday! Xerox Launches The Brand New VersaLink Range! Kim Kardashian Guide To Taking The Perfect Selfie! Happy New Year 2017 From Ink N Toner UK!! Merry Christmas From Ink N Toner UK! What Is Cost Per Page? HP Apologies and Announces Firmware Reversal to Get Compatibles Working Again! New £5 Notes Could Be Worth Hundreds Of Pounds! Sept 16, 1959 The First Successful Copier! Amazing Paper Trick To Impress Your Friends! Feeling Blue? Print Out Free Hug Voucher! How the Internet reacted to the UK’s vote to leave the EU? Free Printable Paper Fortune Teller!! Happy Birthday Robert Downey Jr! Captain America: Civil War Trailer 2! Looking For A New Printer? Leo Finally Wins an Oscar! New Captain America: Civil War Teaser! February 1st – What’s Happening in London? Chocolate Cake Day! Print Off Your Chocolate Cake Recipe! Happy Birthday Nicolas Cage and Jeremy Renner! Star Wars: The Force Awakens OUT NOW! Sherlock New Years Day Special – New Trailer! Fantastic Beasts and Where to Find Them Trailer! Want a free Xmas gift? Free Christmas Gift Tags This Week! Captain America: Civil War Trailer! Travel Tuesday – Print off your Holiday Photos! Movember Moustaches – Print your own Moustache! Happy Anniversary Queen Elizabeth II and Prince Philip! Make an Awesome Paper Airplane! Print your own Super Mario Papercraft! Make Your Own Cassette Tape Wallet! Happy Bonfire Night 2015! Print out your Fireworks Printable! Are You a Scorpio? Print out your Zodiac! Rugby World Cup Final! Free World Cup Poster! Happy Birthday Nightmare Before Christmas!